I’ll tell you, it’s the song lengths that get you. My experience with progressive metal has taught me that whenever a band decides to write a 20 minute long song, they are doing a risky move. 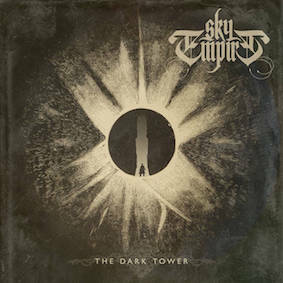 London based quintet Sky Empire have two of these monumental tracks on their labyrinthine album The Dark Tower but have still found a way to stay listenable. It’s easy to tell from the beginning that they are very talented and skilled musicians and their debut is a wisely managed dose of contained technicality and musicianship that finds itself right on the edge of becoming too complicated to be enjoyable. The band’s sound is based on a combination of progressive metal and classic prog-rock and they take a lot from the giants of these genres. Their guitar work and drums especially scream of Dream Theater’s legacy, but they’ve still distanced themselves enough to not become a clone band. They stick to the more technical aspect of the progressive sound spectrum containing their tempo-changing riffing and eloquent solos into a lot of aggression and punch. Yes, there’s a lot of ‘nerding’ about, but the instrumental work is still great, turning the full soundscape into an insidious maze of ideas and solos. Despite the skill and work put into the record, it is still a difficult listen. At 75 minutes in length from just 5 tracks, it’s an ambitious challenge to keep anyone interested all the way. There are a lot of soft interludes allowing you to draw breath, contrasting with the complex stuff, and balancing out the album, but it still feels a bit too far-fetched and would probably do better sitting at the one-hour barrier. So grab your geeky glasses, hold on to your butts, and hop on board. Can we make it to the end? The guitar work is formidable. Drazic Lecutier is an obvious trespasser of Petrucci territory for the most part, both in his riffing and in his soloing, but his heavier Pantera influences take him in a grey area between genres that give him some originality. He’s the main composer in the band and with some unexpected staccatos, uncommon melodies and original songwriting, he has saved his buddies from a lifetime of being finger pointed as Dream Theater rip-offs. However, on the first half of the album, I find the drumming to be the real star of the show. On top of his progressive grooves, Remi Jalabert simply cannot stand any empty space. Persistently filling every gap with an extra fill or passage, he often steals the spotlight from other instruments even during solos, but in a sea of over-the-top musicianship he somehow doesn’t exceed his role and does so by simply using the right timing for his ideas. What this album really needs is good sound, and the production is good enough to allow you to hear every instrument and to give justice to the songs but the album feels a bit powerless at climax moments. It could use more depth to really shine and have that extra impact. However, the sound engineering seems to give the album a bit of ‘oldie but goldie’ vibe, reminding of great classic prog rock artists in the vein of Rush or Deep Purple. In fact, when I think about the way the dramatic vocals are reflected and combined with the synths, it even sounds a bit psychedelic. Keyboards also show tremendous solos and are probably the most ‘dated’ piece of the puzzle with the typical classic rock organ sound. The best use of both keys and vocals comes in the first half of “Sorcerer’s Apprentice” on a very nice piano-based melodic section. Definitely one of the best bits on the album, and overall I think the piano parts bring more to the picture than the synths. This is definitely a very promising album from a group that only came into existence this year. Sky Empire is a band with a lot of good influences and they definitely target a certain category of people. There are some minor drawbacks with the album but not enough to take away the experience from the listener. They have enough originality to stay fresh and also have the potential to ignite the nostalgia in fans of older giants like Dream Theater, or Deep Purple. If any of these names ring a positive bell to you then “The Dark Tower” is easily worth the challenge that it rises. All 75 minutes of it. This entry was posted in Bands, Hard Rock, Progressive Metal, Reviews, Unsigned Reviews and tagged '70s prog, 8.5/10, CD, classic rock, Deep Purple, Dream Theater, Independent, independent reviews, LP, prog, Prog Metal, prog rock, progressive metal, Progressive Rock, Rush, Sky Empire, The Dark Tower, Unsigned/Independent.